On Wednesday, September 17, events will be held in Canadian cities to commemorate the one-year anniversary of strikes by immigrants detained in Lindsay. On September 17th of 2013, 191 migrant detainees jailed in Central East Correctional Centre, a maximum-security prison in Lindsay, Ontario, began a hunger strike, and later began boycotting their detention reviews, that they considered bogus. They demanded an end to indefinite and arbitrary immigration detention. Although some strikers have been fined or deported, and others released from detention, the strike continues. 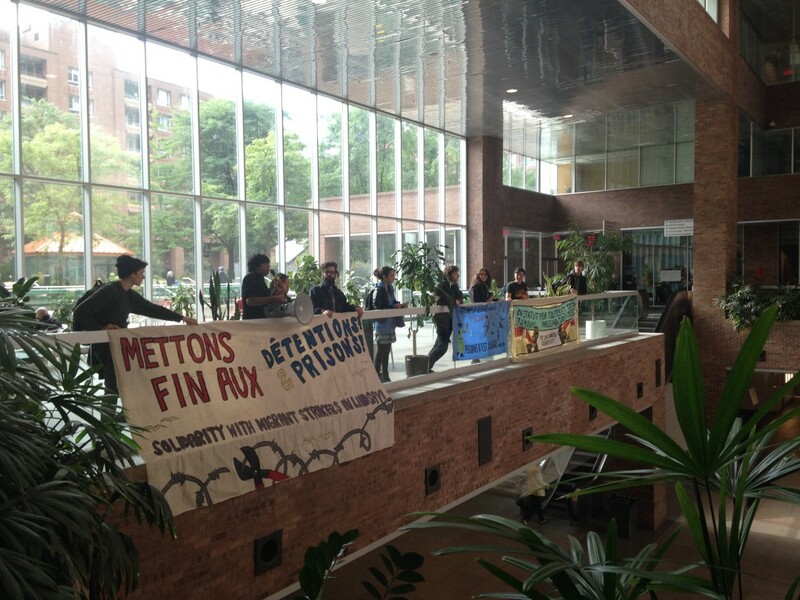 This year, Montrealers will hold a rally at the Guy-Favreau Complex, where the Immigration Refugee Board holds detention review hearings almost every day. We do so to express solidarity with the strike in Lindsay, to demand an end to all immigration detention and to double punishment, and to denounce the criminalization and incarceration of poor, racialized and marginalized people. This process of criminalization has been ongoing for decades and centuries but has accelerated through recent changes to immigration and criminal law. Between 2008 and 2013, approximately 80,000 migrants were detained in Canada. Canada has no limits on detention periods, with at least one migrant remaining in detention in Lindsay for over ten years, without trial or charge. Detention reviews, such as those that regularly occur at the Immigration and Refugee Board where the action will take place, are arbitrary, the outcomes depending largely on which board member hears the review; a recent report from the End Immgration Detention Network showed release rates varying widely, between 5% and 33% according to the board member. Double punishment is another way in which migrants are affected by racial profiling and criminalization. By removing permanent resident status and deporting people who have already completed their sentence under Canadian criminal law, the government is punishing migrants twice for the same thing. Many of the people affected by this policy have spent most of their lives in Canada and are rooted in their communities. One extreme example of double punishment is the situation of Deepan Budlakoti, a Canadian-born man who has been rendered stateless and is fighting removal to a country where he has never lived.